The macSVG menu contains the usual application menu items. The Preferences menu command is not implemented yet, so it is currently disabled. A Preferences panel will be added in a future release. 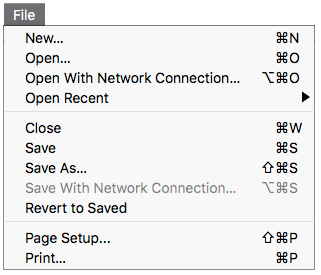 The File menu contains the standard macOS commands to create a new SVG document, open an existing document, and save documents. 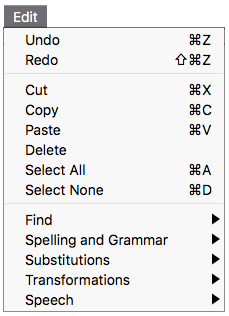 The Edit menu contains the usual commands for Undo/Redo, Cut/Copy/Paste, Select All/Select None, etc. 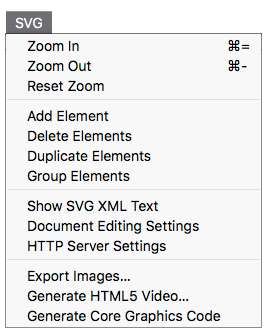 The Zoom In/Zoom Out commands apply a CSS style attribute to the <svg> element, setting the “zoom” value to double or half of the current zoom value. There are two kinds of macSVG plug-ins. Most plug-ins operate in the document window, but some have a menu command instead. The “Transform Elements Base Coordinates” demonstrates how a plug-in can operate on multiple selected elements. 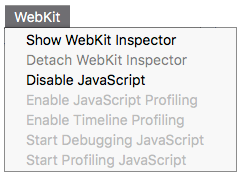 macSVG uses the standard macOS WebKit framework, which provides access to the WebKit Web Inspector. 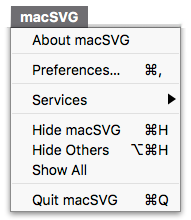 macSVG has the standard Window menu. 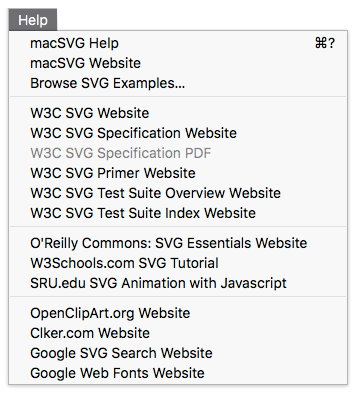 The Help menu contains a variety of useful commands to access SVG documentation popular resources. See the Documentation and Resources section of the User’s Guide for additional information about the Help menu.